Hi loves! Since I am enjoying a well deserved vacation in NYC, I asked 2 girls to join me and fill in some gaps with a guestpost. Today I have Emily from Very Emily and I couldn't be more honored! 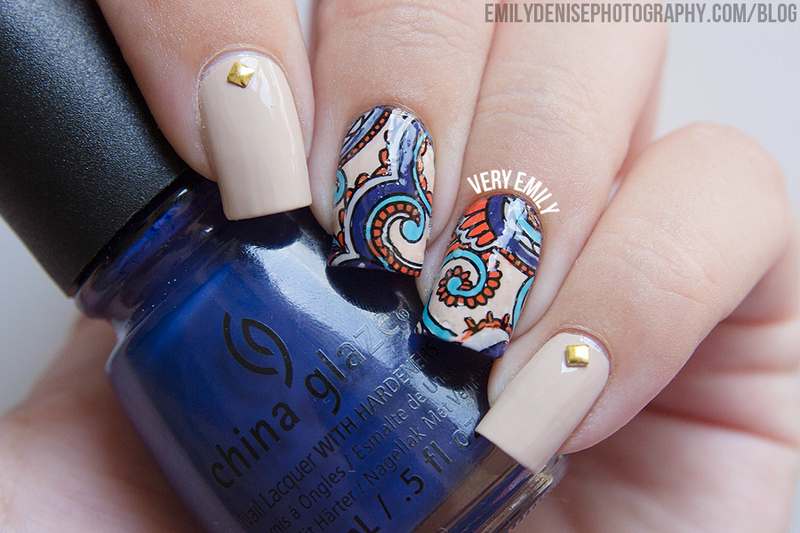 She does the bestest nail art and swatches and I adore her blog and Emily herself ♥. Thanks doll for making this beautiful guestpost, I'm really happy to finally be able to share it :D! Hi everyone! It's Emily from the blog Very Emily. I am so honoured to be guest posting for Deborah today! I hope she is having an absolute blast in NYC. I've been a big fan of Love Varnish for ages so I'm pretty excited to be here. I'm totally fangirling and it's really nice to repay the favour as Deborah guest posted for me not too long ago. I only recently got into stamping and Deborah is definitely one of the bloggers that inspired me. I just love her flawless stamped manicures! So I created this reverse stamping decal for my post, it's actually the first one I ever did. Deborah gave me a lot of time to create a guest post, I think she asked me nearly two months in advance (?) so obviously I did these the same day she asked. Haha! I simply couldn't contain my excitement. A while ago when we were talking about films I mentioned how much I loved Wes Anderson so she told me about a Tumblr page called Wes Anderson Palettes. I took inspiration from this page for my colour scheme! I started with Barry M Lychee as a base on all nails. Then I created the stamping decal using Born Pretty Store image plate QA88 and filled it in with Barry M Lychee, Sally Hansen Fiery Island, China Glaze Queen B, Barry M Pure Turquoise and Essence Got A Secret. 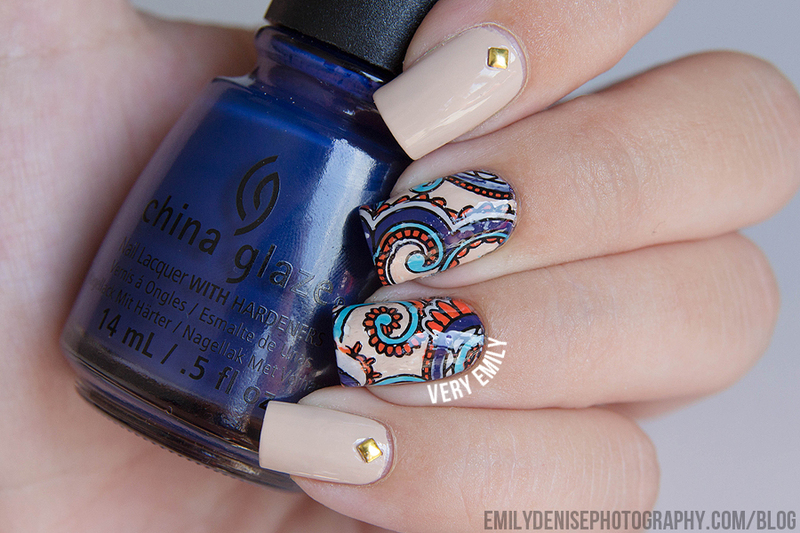 Woah, aren't these nails the cutest?! I adore this design and will totally order that image plate as well ^^. Please make sure you check out Em's blog, Facebook, Twitter, Tumblr and Instagram! I hope you're having fun in NYC! Go see a Broadway show for me. :) Gorgeous nails Emily! Love accent nails, they are so fun! Wes Anderson palettes! How cool! I absolutely love this! Amazing decals! Gah! Emily these are fantastic! 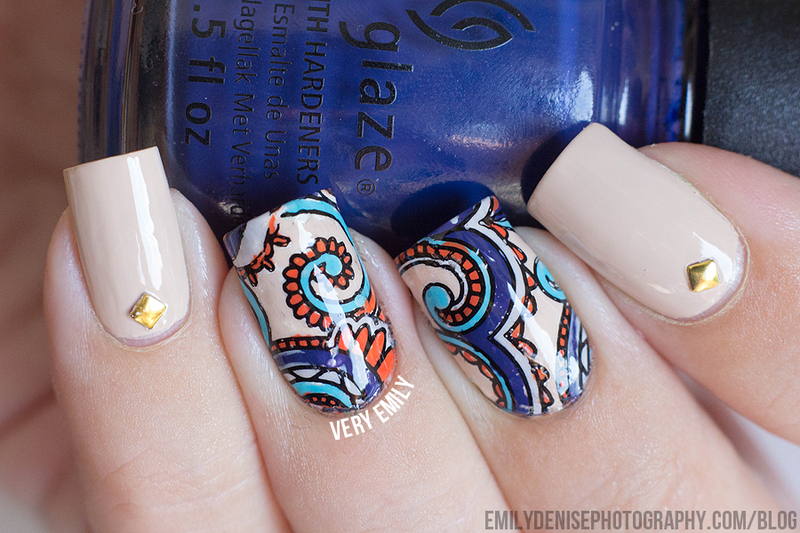 I realllly need to try making decals myself too, but I am so intimidated by gorgeous manicures like these haha. They look fantastic! I love Emily's nails so much.